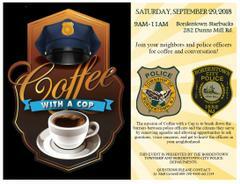 Township & City PD's hold joint Coffee with a Cop event tomorrow! Please join your Township and City Police Departments tomorrow morning from 9am - 11am at the Bordentown Starbucks for Coffee with a Cop. Complimentary coffee will be served! Coffee with a Cop seeks to break down the barriers between police officers and the citizens they serve by removing agendas and allowing opportunities to ask questions, voice concerns and get to know the officers in your neighborhood.